This mini craft can be whipped in just a few minutes. They look beautiful placed around a Thanksgiving table or across a mantel. 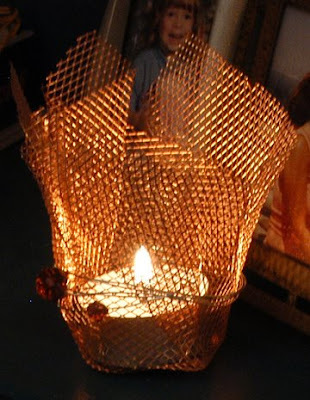 The copper wire mesh is available at most craft stores and comes in a roll. 1. Cut a square of copper mesh about 6 inches on each side. 2. Center the votive holder on the wire mesh and fold the mesh up around the votive holder as desired. Press the mesh to crease it and hold the shape. Remove the votive holder. 3. Cut a long piece of wire and make a loop in one end. Thread one or two glass beds onto the wire and wrap the wire around the mesh several times, adding beads as desired. At the end of the wire, thread on one or two beads. Either tuck the excess wire into the mesh or make a loop to hold the beads and twist the two beaded ends together. Insert a tea light. Wow! So many great projects here today. I'll be linking. I just love copper. Have to see if I can make the mesh out of copper and then make the votives. Sounds like a fun project. that is so nice... is any video for this on the website?????????? and what kind the store that i can get copper wire mesh??????? Aren't those pretty! So simple and airy. Thanks for sharing ... I've posted a link.